Israeli PM says IDF ‘the only army in the world confronting Iran’s military,’ warns Hamas not to escalate conflict with Israel. Israeli Prime Minister Binyamin Netanyahu, who also serves as Defense Minister, warned Hamas and other terrorist groups in the Gaza Strip not to escalate their conflict with Israel, a day after a sniper attack along the Gaza border left one IDF soldier wounded. 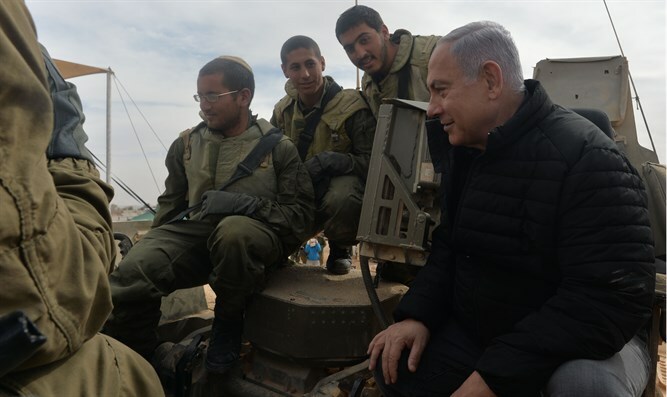 “If there is someone in Gaza who is thinking of lifting up their head, I advise them not to do it, because our response will be deadly and very painful,” Netanyahu said while visiting officer cadets during a training exercise at Shizafon base. Netanyahu also discussed Israel’s recent strikes on Iranian forces inside of Syria. On Monday, Israeli forces struck Syrian and Iranian targets inside of Syria, killing 21, according to the Syrian Observatory for Human Rights. Fifteen of the dead were identified as “foreign nationals”, typically referring to Iranian soldiers. Yesterday, an IDF soldier was lightly injured when a terrorist sniper operating out of the Gaza Strip shot him in the head. The soldier survived the attack with only light injuries thanks to his helmet, which stopped the bullet. Following the attack, Netanyahu blocked the transfer of Qatari funds to the Gaza Strip. The IDF later conducted an airstrike on a Hamas military camp in retaliation for the sniper attack.